Are you looking for something that can beautifully lighten-up your private garden, or balcony? Or, are you searching for a light that can brighten up your neighborhood landscape? Have you ever heard about the beautiful outdoor solar spot lights? Well, these are the lights that run on the solar energy. These lights convert solar energy into electrical energy. Solar lights, in general, may use the photovoltaics (PV) directly, or may also use concentrated solar energy, or a combination of both. 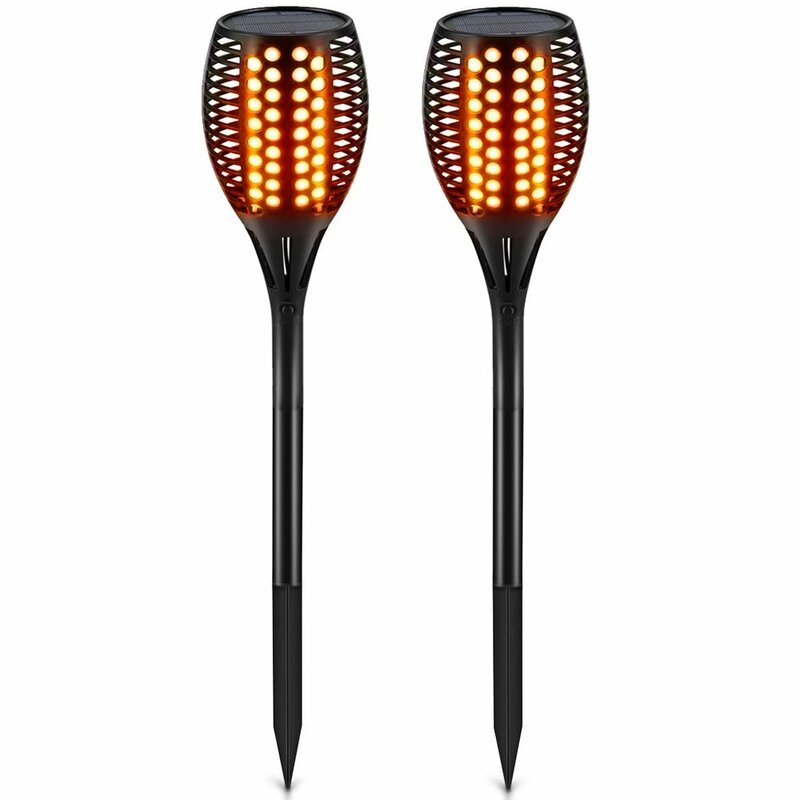 They charge themselves during the day, utilizing the abundant solar energy, and brighten your garden, during the night. Bigger solar panels obviously provide a better amount of light. An important aspect of solar lights is their batteries, which need to be cleaned and no dust or residue should deposit on the same, otherwise, their performance may be affected. Most of the solar lights have built solar panels, however, separate panels are also available, and are as efficient as the built-in panels. 1 What are the benefits of outdoor solar spot lights? 2 What are the types of outdoor solar spot lights? 3 What are the top 5 outdoor solar spot light reviews 2019 ? 4 How do outdoor solar spot lights work and illuminate your yard? 5 Does cold weather affect outdoor solar spot lights? 6 How long do batteries in outdoor solar spot lights last? 8 How to install portfolio outdoor solar spot lights? What are the benefits of outdoor solar spot lights? The outdoor solar spot lights come with a list of advantages. The benefits of the outdoor solar spot lights include their free source of energy: the solar energy. Until recently, they lights provided dim-lights, but with the advent of technology, outdoor solar spot lights are now available in Light Emitting Diodes (LED), which emit high light and have replaced the conventional lights. They do not require any main outlet to power them. Rather they use the free solar energy that saves you bucks and is a reliable source of energy. They are cost-effective as they are cheaper than the electrical lights, relatively easier to use, no special installations are required and you can install them on your own, and they have a low maintenance. Further, they do not add to your energy bills. They are a green technology and are environment-friendly. They use solar energy and would help you in reducing the carbon footprint. They are safe to use, as there no electrical wires, and thus, can also be used for temporary arrangements like family outings. They are available in many sizes and styles. You may find a solar light of the colour of your choice, and they also have a range of different uses. You can use them to add an aesthetic value to your garden or focussing and highlight an area of your garden. When you go for a vacation, your garden would be lighted-up on automatically, and that would save you from house-burglary. In the case of power outages, you can rely on your solar lights, to work and provide light to your home. There are portable and easy to move. They would charge themselves automatically during the day and lights-up as soon as the sun sets. What are the types of outdoor solar spot lights? 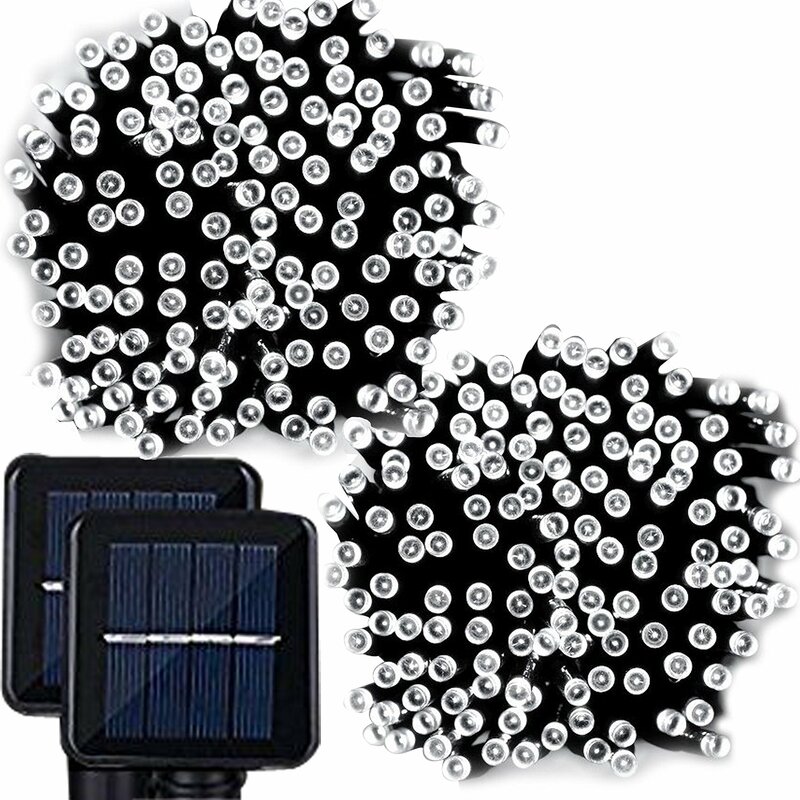 Solar garden accent lights provide a dim light and are used to mark a place. They cannot illuminate or lighten up a place, object, or pathway. Their energy consumption is also low, due to which they can work for many hours and their runtime is longer than the other types of solar lights. Once charged for a day, they can provide light for many nights. The cells that solar accent lights use are multi-crystalline solar cells, which allow them to charge themselves, even on the cloudy days. In order to create a softer light, many solar accent lights utilize an amber LED to produce a mild ambiance. You would also find some solar accent lights to twinkle like the candles, and interestingly they consume less power. So, all in all, they are the beautiful lights that consume less energy rate. 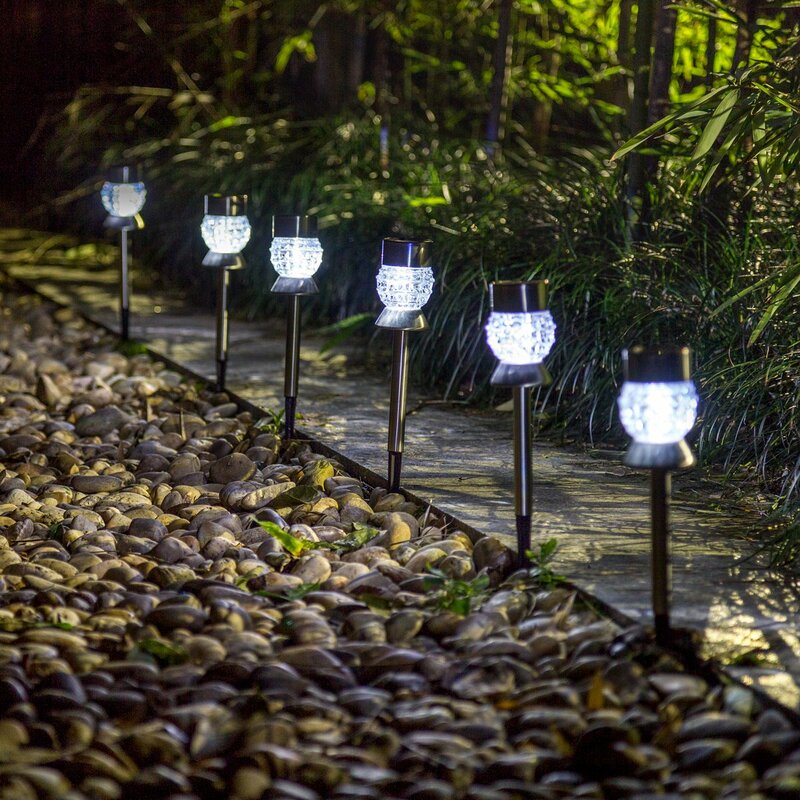 Solar accent lights can be used to mark any hazard or to beautify the garden. You would love them more as they are very pocket-friendly. Solar path lights work just the same as their name suggests, they light-up the path. These lights can be used for lightening the driveways, pathways, walkways, or any other smaller area in a house or landscape. In order to produce the best results, solar path lights are suggested to be used in multiples along a dark walk or a stair set, to guide the way. The positioning options in these lights are numerous as they come along with a range of flange mounts, ground stakes, and hanging hooks. However, a majority of the solar path lights are designed to a downward focussing of the light. A very useful feature that path lights have is it’s on/off switch. If you want to switch off your light, or you want to save/store the energy, then this feature allows you to switch on or off your light, as per your requirement. Solar path lights come in a variety of choices. You can find coloured lenses of your choice, or high to low power lights, as per the requirements. Overall they are a good choice, both economically and light output. 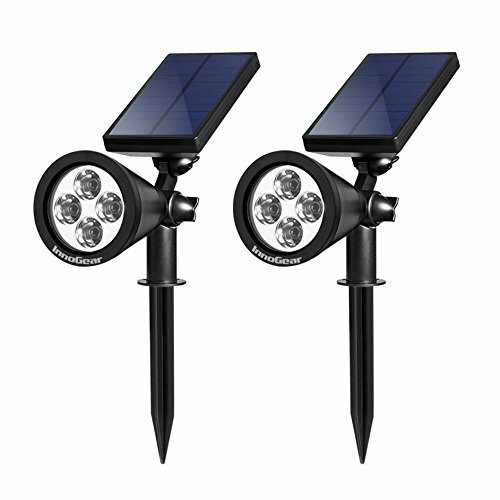 Solar task and spot lights provide a heavy beam of light and can be used for lightening-up your plants, entryways, or statuary. In the class of outdoor solar spot lights, they are the brightest, and therefore, obviously carry a hefty price tag. But that does not mean that these lights would be able to provide illumination equal to a 100 watt light. A good solar task or spot light with a focussed beam of light would be able to produce a brightness equivalent to a 40-watt shining light. If you are impressed by the solar task and spot lights, then there is another feature of theirs that would love more. They can be adjusted to focus their light in different directions, and are flexible to be mounted in a number of different ways. The solar panel of these lights can be a separate entity and can be placed at a suitable place with adequate sunlight, and you can mount the light at the place of your choice. The high price of solar task and spot lights should not bother you as they are durable. One of the prime features of solar task and spot lights is that as the temperature lowers down, the solar lights which use LEDs light even brighter. Their solid state design enables them to perform this little-known function. Thus, they are superior in their functionality, as compared to the low-voltage and the fluorescent lights which are compact and work less efficiently during the colder climatic conditions. What are the top 5 outdoor solar spot light reviews 2019 ? The top rated outdoor solar spot lights depend up on your requirements. These are the fabulous dancing-frame design lights and are highly recommended for parties, garden, fence, deck, and bench. They are water-proof, and highly durable. They come in a pack of 96 LEDs. The LEDs are premium and are able to run for as long as 50,000 hours, in their complete life-time. The efficiency of their solar-panel is very high. The lights also have an automatic switch and they would turn on/off themselves. The built of these TomCare lights is of plastic, and the lights are easy to install, as no wiring is required for their installation. But, they are little expensive. However, keeping in view their features and durability, we would highly recommend them to you. If you want a warm, white-toned light, then invest in the InnoGear Upgraded Solar Lights 2-in-1 Waterproof Outdoor Landscape Lighting. These lights give a welcoming feeling and would create an environment for you to sit and relax. They have an upgraded frosted solar panel which does not require any protective-film. The panel is water-proof and heat-proof. They are efficient and work for long hours, once charged. They provide wattage of 1.5 watts and come with a two-in-one option, as they can be mounted on to the wall as well as stick to the ground. Additionally, they have an adjustable solar panel and light. The brightness can be adjusted in two different modes. What else do you need more? A problem in these lights is that the material used for making their structure is plastic, which may deteriorate with time. These lights are the best for illuminating your landscape or pathway. They create a beautiful, romantic atmosphere and are best for your garden, villa, lawn. These lights have a decent illumination and have a unique design that would appeal your eyes. They are easy to install with no wiring required to operate them. They are weatherproof and can withstand rain and mild snow. These lights have an elegant design with a transparent material of lamp that would create a dressy look in your garden mat. They take up to 8 hours to get fully charged. The efficiency of these lights might vary with the weather conditions. The only con that these light have is that material with which they are made up is plastic, otherwise, they are good and pocket-friendly. These lights come in a pair of 8. They have an elegant design and are concise. Plus, you would have an option to choose from two stake colors, silver and black. We recommend the silver one though, as it is really classy. They have a plastic lens that would create a unique decorative light effect on the ground. Each light has one LED with an output of 6 Lumen. They are pretty easy to install. You just have to force them into the soil, let them charge, and afterward, they would do their part. They also come with an automatic switch off/on sensors, and you don’t have to bother about doing this every day. They are made of stainless steel and are highly durable. Although they are a little expensive as compared to their competitors, they have a stronger built and are highly efficient as they have AA Ni-Mh batteries. These beautiful, eye-catchy lights will make your garden look much more appealing, at a very low cost. They have elongated LED bulbs, which would give an extensive lightening to your garden. They are appropriate for both the summers and the winters. They are best suited for decorating wedding, parties, Christmas, or just your garden. They give a warm, festive look that would enhance the beauty of your home. They charge in a period of 6-8 hours and work for good 8 to 10 hours, and are pocket-friendly. Installation is also easy. You would have to insert the panel stake into the ground and mount the lights on the place of your choice and pattern that you like. They are certified water-proof lights and would work-well in rainy season also. They come with an extra-long cable that would allow you to decorate the areas at your garden that are farther from the panel. They also come with an auto off/on the button. The lights run for a good 10000 hours in their life. What we loved are the two modes at which you can set these lights. You can set them on a “steady” mode or a “twinkling” mode, as per your choice and requirements. The disadvantage of these lights is that their build is of plastic which would affect their lives, in long-run. How do outdoor solar spot lights work and illuminate your yard? outdoor solar spot lights are one of the most popular lights of the present times. And, of course, the credit goes to the free source of energy that they utilize, the solar energy. They are clean and green technology that is environmentally friendly and save your electricity bill. They are easy to install and unlike the conventional lights, no wiring is required. You just take your outdoor solar spot light and place it at the spot of your choice, and there you go. A major plus point of the solar lights is their built-in sensor that detects the darkness and automatically switches off the light. So, you don’t have to remind yourself to switch on/off your solar lights. Just sit and enjoy their beauty. They come in different shapes, brightness, and with a long run time. We would discuss the basic components of the solar lights so that you may get a better insight of how they actually work. The solar panel consists of the photovoltaic cells which convert the solar energy into electrical energy. It is the main part, the efficacy of which determines the brightness of the light. The quality and size of the solar cells and the clarity of the protective cover play a major role in the effectiveness of the solar panel. Just for your information, the first solar cell was developed in the 1880’s, by Charles Fritts. Being too good at their work, haven’t this technology took too much of time to be popular? We are glad that people are now becoming more aware of this great, energy efficient, and environment-friendly technology. The solar panel would be the most expensive part of your solar light and do not hesitate to spend some extra money on it, as this is actually going to affect the output of your landscape light. But, with the advancement of technology, and lowering prices of the photovoltaic cells, the price tags of the solar panel are also lowering. And, in the coming times, you would be able to find an even cheaper solar panel. Batteries are also a key component of the solar lights. They are the renewable energy batteries and are typically the deep-cycle batteries which mean that they are able to store enough amount of energy that your lights would run for a really prolonged period of time. You should consider the cost, installation, cycle life, and maintenance of the solar batteries, before buying them. They are the deep-cycle batteries which are being used for off-grid applications, for quite a long time. Lead acid batteries are reliable as well as economical. They would cost you half a price of the lithium ion battery. These days the Valve-Regulated Lead Acid batteries (VRLA), also known as sealed lead acid batteries or the maintenance free batteries, are coming with an Absorbent Glass Mat (AGM) which primarily serves the dual-purpose or emergency backup. AGMs have fiberglass mesh which serves to contain an electrolyte. They have better self-discharging features, at different temperatures. Another type of VRLA is the gel model batteries which contain a gel-based electrolyte. They reduce the electrolyte evaporation and spillage and have a better-increased resistance to the voltage-fluctuations, vibrations, and shocks. They can be mounted in any direction, and do not require a regular maintenance. But that does not mean that you do not require cleaning them regularly, or running a functioning test. Do clean them occasionally and they would perform better for you. Both AGM and gel batteries are recombinant and internally produce water. They do not contain any free acid and can be installed in any direction. These features make them suitable for remote areas, or hard-to-reach places, as you don’t have to check or maintain them every now and then. The third type prismatic, are broadly used for solar storage. They have corrugated sides which help in cooling-off, by creating the gap between the adjoining cells. They need a battery management system in order to monitor the temperature and voltage of each cell. This prevents the cells from over-charging and discharging. They would provide you with a better number of cycles as compared to the lead acid batteries and are light-weight, relatively easier to install, as well as compact. These are the latest technology and are known as vanadium redox or vanadium flow batteries. They are completely containerized, discharge 100 per cent of the energy, non-inflammable, and may work up to 20 years. If a large electrolyte storage tank is used to them, they can offer an unlimited amount of energy. There are no cycling limitations, and continuous charge/discharge does not affect their lifespan. They are easy to maintain, but are large and thus, more suitable for the industrial scale set-ups. LEDs are just like the small bulbs and are connected to the electrical circuit. They have a longer life, as there is no filament like the conventional bulbs. The brightness of the LEDs can be increased by combining them with a small halogen bulb, but halogen bulbs are more appropriate for the solar security lights. Obviously, a high quality wiring would improve the performance and increase the life of your solar light, and thus, are an important part of the same. Depending upon the components of the outdoor solar spot lights, the run-time of these lights may vary hugely. It may range from a few hours to a few days. So, you have to select the solar light carefully, by considering all your requirements. outdoor solar spot lights need a UV-stable housing. The placement of your light is an important aspect. The solar panel should face south and be perpendicular to the sun, so that it may store maximum energy. Your lights should also not be placed near any other bright source, as this may lead to switching off the lights, by automatic sensors of the solar lights. Does cold weather affect outdoor solar spot lights? As long as your outdoor solar spot lights have an access to an unobstructed sunlight, you don’t have to worry about the working of the lights. The summer being at their peak from the June to September, would allow your solar lights to charge well and the lights would give their best performance during the time. The modern outdoor solar spot lights are very durable and are able to bear the harsh climatic conditions. In cold climatic conditions, the solar lights capture any of the light that is available and convert it into electrical energy. Solar lights convert the solar energy at a higher rate as compared to the rate of conversion during summers. However, rain and snow can be damaging for the outdoor solar spot lights. You can remove the snow manually, or wait until the snow melts away, and the panel resumes the charging. Also, in case you are storing your lights during the winter season that would last from December to March, make sure the lights are switched off, and store them in a dry location. How long do batteries in outdoor solar spot lights last? If you take good care of your solar lights, then the rechargeable battery should last at least 2 years. However, there are some variants in which the batteries last up to 15 years. If you invest in a good light, allow them to charge them completely, and clean them regularly then the life of your solar lights would definitely impress you. There would be sometimes when your outdoor solar spot lights might work properly, or not work at all. After all, they are devices and face the wear and tear during their functioning. The first thing that you should check if your light is not working, is its battery. Battery-life deteriorates with time and you should replace the battery of your outdoor solar spot light every two years. In case your local area faces a rough climate, it might have a bad effect on your light as well, and you should consider replacing the battery yearly. Another thing that you should check is if there is a debris deposition on the panel. This may disrupt the collection of solar energy by the light. Clear the dust and debris off the panel, and check if the light is working now. Check if the outdoor solar spot light is turned off or not. There might be a possibility that it is just turned off and this small step would lighten-up your area. If you have purchased a new light, and it is not working, then check if the pull tab on the battery is removed. It is required to be pulled off in order to start the lights to work. Check if the panel is positioned correctly and is positioned to receive maximum unhindered solar energy. If your light is still not working, then switch if off, and allow it to charge for 72 hours. Your lights will charge even they are switched off and turning them off would allow the battery to charge itself to the fullest. If you have tried all of these steps, and your outdoor solar spot light is still not lightening-up for you, then probably you should contact your retailer and get it replaced, if the light is in warranty. Otherwise, you may get the light repaired, to resume its working. How to install portfolio outdoor solar spot lights? You can install your outdoor solar spot light yourself, or hire a solar light installation expert, who would do the job for you. The first step to install is to decide whether you want to install the light to illuminate an object in your yard or a pathway. If it is an object that you want to lighten-up, then keep the light close to it and in a position that the direction of the light focuses onto the object. If you want to place the light alongside the pathway, then keep the light close together, so that they collectively provide an adequate amount of light to the pathway. Place the lights away from any obstructions, so that they may not be damaged, and are visible during the day. You can mount your portfolio lights on a metal spike if they mountable. Otherwise, you can just force them into the soil until they are stabilized. Find a position where your light would be able to grasp the maximum amount of sunlight and work without stopping. Place the panel in such a position so that it may charge to the fullest. The solar panel needs to be placed at a position where it may receive maximum sunlight, and you need to attach it to the fixture, using a cable. Bury the cable at least 6 inches into the ground, so that it may not get damaged by the rain or snow. Ensure to completely charge the batteries, and allow them to receive at least 12 to 14 h of sunlight, before installation. Also, clean up the panel before installation. When preparing the soil to install your outdoor solar spot light, water the soil before several hours. This would ease-up the installation if the soil is hard or dry. Do not apply too much force while installing the stake of the light into the soil, otherwise, the stake may break, and your light would not work. Although the outdoor solar spot lights would not let you put much effort in order to make them work, some tips, however, would improve their performance and life. Position the solar panel in such a position that they have an access to sunlight, for at least 6 to 8 hours. You might be very thrilled to install and make use of solar lights, as soon as you brought them. But, one thing you should keep in mind is to allow them to charge themselves for 5 to 10 cycles. Do not install your light near any other night-light devices. This would switch off the outdoor solar spot lights, as they have inbuilt sensors that detect light and dawn. Do not forget your outdoor solar spot light, once you have installed them. Do proper care of them. Clear off any dust, debris, moisture, or snow from the panel, as it would reduce the capacity of the battery to charge. Replace the batteries every 2 years. This would maintain their charging capacity. If you want to store your outdoor solar spot light, then opt for a place that is dry and maintains a room temperature. The batteries need to charge once a month, even if they are stored. So, keep the lights at a place where they can receive some light. Do not store your outdoor solar spot lights for a longer period of time, as it would affect their performance. Fully charge and discharge the batteries once a month, during storage. The outdoor solar spot lights are becoming enormously popular with times. These eye-catchy lights offer a cute and attractive light for your garden. They require slightest efforts for installation, maintenance, and other hassles. They would save your energy bills and help you in contributing to keeping the environment sustainable. They have almost zero emissions and also reduce the carbon footprint. You would not have to worry about switching the lights on or off. With so many benefits, it is hard to ignore the appealing outdoor solar spot lights. 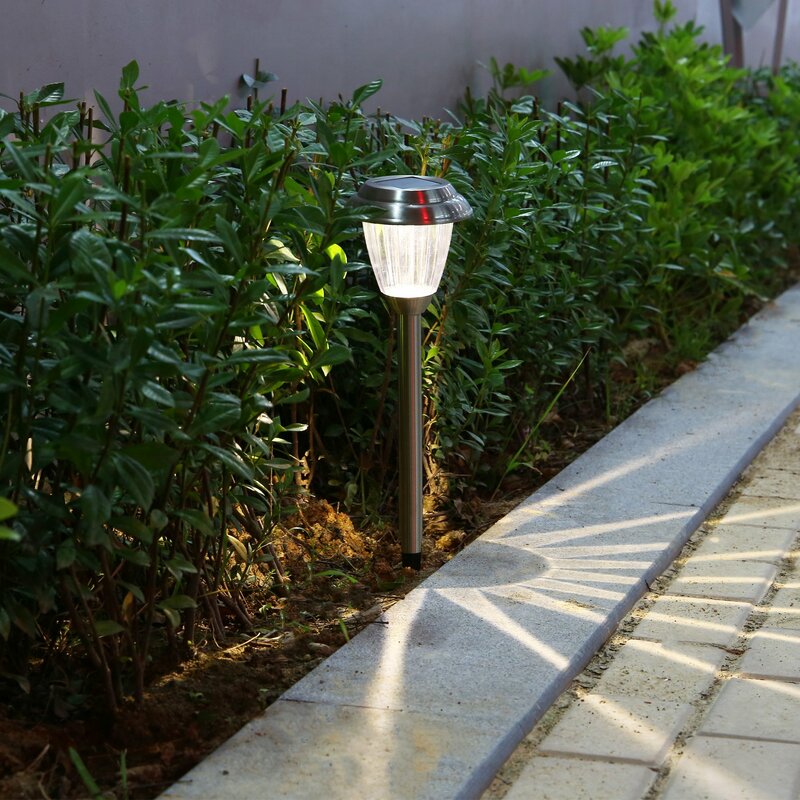 Keeping in view the variety of the available outdoor solar spot lights, their price range, and lifespan, outdoor solar spot lights would be the best choice in a long run, for illuminating your garden or pathways. Choose your lights carefully depending up on your requirements, and place of installation. Do not hurry and buy the first light that you see. Check the other variants, and see which option is best for you. Invest them today and feel the difference!